I, [Your Full Real Name Here], certify under penalty of perjury, that I am the owner of certain intellectual property rights. The items or materials listed below are not authorized for use at the domain of ([infringing website domain here]) and therefore infringes my rights as copyright owner. I hereby demand that you act expeditiously to remove or disable access to the material or items claimed to be infringing. * Gpu (Gpu usage and temperature. Currently supports one Gpu.) Will not work with Integrated Graphics! If you have Rainmeter installed, then that's basically all you have to do! 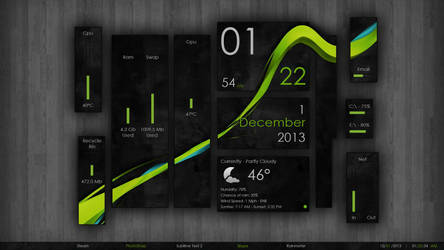 Required Rainmeter version: 4.3.0.3273 or higher. All theme wallpapers are included in the package! Programs used for system temps! To get the best use out of the taskbars included, I recommend using Desktop Coral. If for some reason you find yourself needing a fresh copy of Stangowner's MSI Afterburner.dll, you should go to this page. All information on how to install the .dll manually is presented at the top of the first post. I'm currently not taking resolution requests! Sorry for the inconvenience! Max resolution I can offer is 1920 x 1080, sorry! Drastically improved SWAP monitoring accuracy. Fixed layout loading "Illustro" skin items if it was installed on the system. Added deep blue color option and changed old "Blue" to "Cyan"
Updated the weather parser to use Weather.com's new XML feed URL. Changed Coretemp download link back to Mediafire because its parent website is being shown as Red Flagged. This event occurs differently depending on what web browser you're using. This will be the last time I'll change the download link unless it's absolutely necessary. Special thanks to user Unramaan for alerting me to this issue! Changed Coretemp download link back to its parent website. There seem to be no more trojan warnings coming from the program's installer. If this changes again, please, anyone inform me! I'll have a clean, safe version of the program ready for download ASAP. Changed Coretemp download link because of dropbox blocking my account due to too much traffic. The file is now being hosted on Mediafire. Changed the CoreTemp download link. This is the correct, and clean, version of CoreTemp. Temporarily took away the resolution request button. Removed the version history tab in the config. Other minor changes to the config. 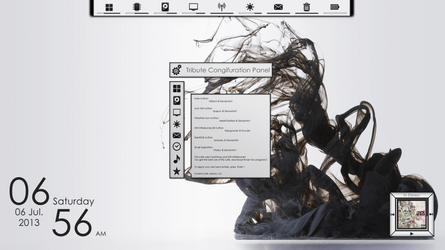 Added themes to the skins features. Fixed Weather Code entry box not displaying in the proper location. Changed how the Recycle Bin app handled displaying the 'Empty' option when showing its current size. Better clarified how you should enter your email username and password. Added ‘Version Information’ tab to the config. Removed many duplicate and unused images. Added variable so users can more easily edit the maximum number of emails that the skin will register. Added 1024 x 768 to the config. Fixed minor bug that would cause swap on the system taskbar to overlap other entries. Fixed a bug where the SWAP values would go into massive negative numbers. Better way of making new resolutions. I'm still figuring out a way to make it 100% automatic. Mixed weather units. Example: Celsius while using Mph for windspeed. Now loads the Config.ini when installed. Added 1600 x 900 to the config. Fixed positioning of the Recycle Bin meter. Fixed random typos throughout the skin. When installing the skin or running the config app, Rainmeter becomes unresponsive and locks up. Thanks to H0rwood, I've found out that the config tool is causing the issue. At this moment I'm not quite sure what's in the config that's causing this to happen. 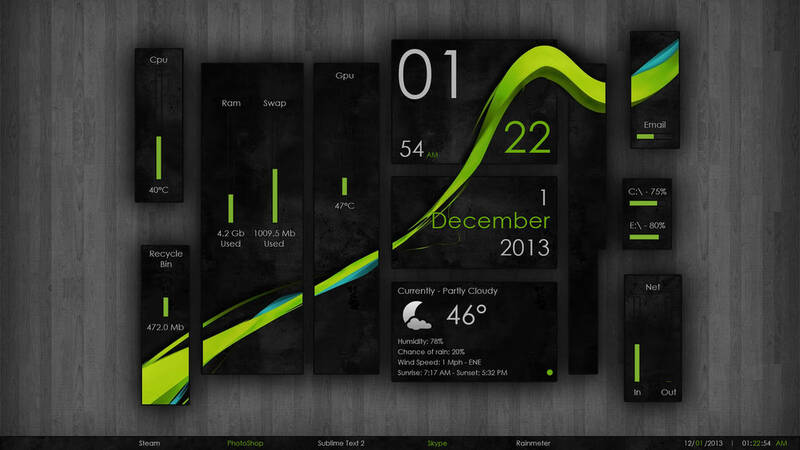 Currently, the workaround is to force close Rainmeter. After that you should be able to edit the 'SkinVariables.inc' file and then launch the apps individually. I've added themes for the current release. So far I have green, red, blue, and dark orange themes, but I'd like to add more. If anyone's good with PS and your interested in helping make more themes, don't hesitate to contact me! Once again, thanks for downloading Wisp! Great person, very grateful for the llama I gave.